Fair Oaks Homes for Sale Located in Sacramento County, known for its mix of suburban and semi-rural neighborhoods. 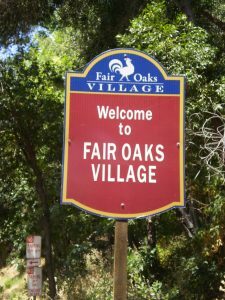 The town center of Fair Oaks is called Old Fair Oaks Village. The Veterans Memorial Amphitheater is located in this part of town. The Fair Oaks Theater Festival takes place here. The village area also hosts the Fair Oaks Fiesta and Car Show, which is co-produced by the Chamber of Commerce each May. The annual Chicken Festival takes place there in September. The town center is located approximately 1/2 mile away from the American River Parkway. There is a Fair Oaks History Center telling the story of the founding and development of Fair Oaks with displays featuring pictures dating from the early 1900’s and many artifacts from the same period. Other recreation attractions include the 114-acre Sailor Bar Park and the American River Parkway and bicycle path which are maintained by Sacramento County. Boating on Lake Natoma and fishing on the American River are other popular pastimes. Have More Questions About Fair Oaks, CA?